A federal program to reduce the cost of providing care to seniors produced sizable savings in Massachusetts over the past three years, adding momentum to efforts to change the way doctors and hospitals are paid for providing health care. New figures show five Massachusetts health systems saved a combined $141 million during that period as part of the program, which aims to rein in costs by better coordinating care for Medicare patients and cutting unnecessary hospital stays and medical services. Doctors manage care for these patients in pools known as Pioneer accountable care organizations. Nationwide, these organizations saved $304 million in three years, federal officials said Tuesday. Still, that is a tiny fraction of the more than $1 trillion spent during this period by Medicare, the government health insurance program for seniors. “The numbers tell me it’s working, that new payment mechanisms are getting providers to change the way they deliver care, and those changes are producing measurable results,” said Dr. Timothy G. Ferris, senior vice president of population health management for Partners HealthCare. Partners said it saved $40 million in providing care to the seniors in its accountable care organization from 2012 to 2014. Beth Israel Deaconess Care Organization, a network of health care providers including Beth Israel Deaconess Medical Center, saved $50 million over the same period, while Steward Health Care System saved $30 million. The physicians group affiliated with Mount Auburn Hospital saved nearly $14 million in three years, and the large physicians network Atrius Health saved $7.5 million. That was less than the other Massachusetts health systems, Atrius said, because it was already saving money by coordinating care for seniors before this federal program was launched. The savings are based on how much Medicare would have spent to provide care to patients under traditional payment systems, known as fee-for-service, which compensate doctors and hospitals for every visit, test, and procedure. 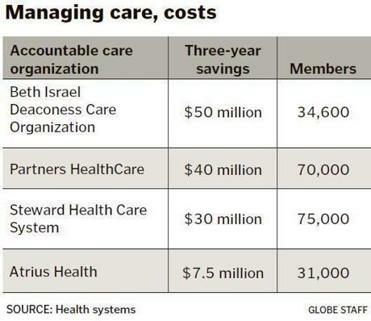 Accountable care organizations give doctors and hospitals spending targets for providing care. When providers come in below budget and achieve high-quality scores, they earn more money and the federal government saves. Accountable care organizations are a key component of the federal Affordable Care Act, also known as Obamacare. Although they cover a small portion of Medicare patients nationwide now, federal officials have said they want to move most Medicare patients and their providers under such alternative payment programs in the next few years. Commercial insurers have developed similar models for patients in commercial health plans. The state’s largest insurer, Blue Cross Blue Shield of Massachusetts, in particular, is working to expand the number of members covered under such payment plans. Five of the 20 Pioneer accountable care organizations nationwide are in Massachusetts. Fifteen of them nationally saved money, while five had losses.